The following is NATO’s policy for strategic communications. Though unclassified, NATO doctrine and policy documents are not released to the public. 1. Today’s information environment, characterized by a 24/7 news cycle, the rise of social networking sites, and the interconnectedness of audiences in and beyond NATO nations territory, directly affects how NATO actions are perceived by key audiences. That perception is always relevant to, and can have a direct effect on the success of NATO operations and policies. NATO must use various channels, including the traditional media, internet-based media and public engagement, to build awareness, understanding, and support for its decisions and operations. This requires a coherent institutional approach, coordination of effort with NATO nations and between all relevant actors, and consistency with agreed NATO policies, procedures and principles. 2. 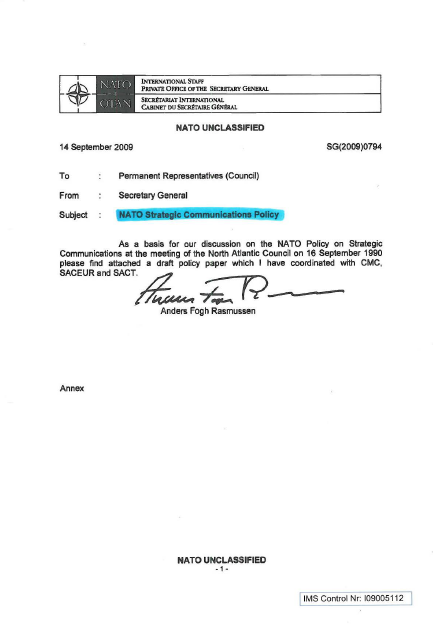 An effective strategic communications policy therefore requires clear definitions of a) the main aims of NATO strategic communications; b) the key principles guiding NATO strategic communications; c) interrelationships between the various information disciplines within NATO (Public Diplomacy, Public Affairs (civilian), Military Public Affairs, Information Operations and Psychological Operations); and d) the roles and authorities of the actors within NATO with communications responsibilities. c. Contribute to general public awareness and understanding of NATO as part of a broader and on-going public diplomacy effort. a. The use of social media is permitted for all NATO military and civilian staff. 18. Violation of these guidelines by personnel under NATO authority will be subject to appropriate sanction.